Last year I went on a business trip to Antofagasta in Chile. It was a great trip and we were made to feel exceedingly welcome. But on Saturday while manning an exhibition stand on the beach (yes really), I was distracted and my iPad Pro was stolen. It happened quickly and was clearly a "professional" job. Luckily I had "Find My iPhone" turned on and had enabled something called Two-Factor Authentication. This means that even if the thieves reset the iPad they would still need my Apple ID and password, and access to a different one of my trusted devices (such as my iPhone or MacBook) to get to any of the iPad data. Brilliant! I strongly I recommend turning these on if you ever plan on using an iPad for an exhibition on a beach in South America. Even better with Find My iPhone on I could track the location of the iPad (especially since it had an LTE connection with pre-paid data). From the comfort of my hotel, I watched the iPad travel up into the hills of Antofogasta - not the most welcoming place, and not somewhere I was going to head up to alone (or even with an eager colleague). In fact, the local police had politely declined to do just that only an hour earlier, mumbling something about "just claim the insurance". I had been very smart with the Find My iPhone feature though. I had cleverly entered a message saying "if this iPad is found, please call XXXXXXX" and my mobile number. But then I got a WhatsApp message to that number with a picture of a man dressed in combat gear carrying an automatic weapon in the desert and a message: "Hello from the Colonel!" Oh, maybe not so smart. Even less smart I then changed the iPad message to "This iPad is stolen, and we know where you are. The police are coming!" which I had translated into Spanish using Google Translate. After subsequent messages from The Colonel, I decided that may not be the best approach either. So I resigned myself to just tracking the iPad and seeing where it ended up. Its next stop was the Aeropuerto Internacional Chacalluta Airport in northern Chile. It stayed in what looked like a storage facility for a day and then appeared in Peru, where it travelled into the mountains again. And it ended up in a little village which I could see on Apple Maps. But I wondered if there was a Street View, so I switched to Google Maps, and would you believe it, there was! I could see a dusty market street, with a building at the top. My iPad was inside that building. Which was amazing! What an incredible success of technology - not only had I tracked my stolen iPad across South America, I could navigate a Street View of where it was almost exactly as if I was there. But I wasn't there. And I wasn't about to go there. And neither were the Police. And I wasn't getting my iPad back. This tracking was incredible but ultimately useless in this scenario. Which brings me on to the Kardia Band from AliveCor. It also is amazing technology that tracks your heart rate thythms, but this band, far from being useless, could in fact be the most useful thing in the world for the right person. For the wrong scenario though (like as a training device for a triathlete) it's still sort of useless. So Why Am I Reviewing the Kardia Band? 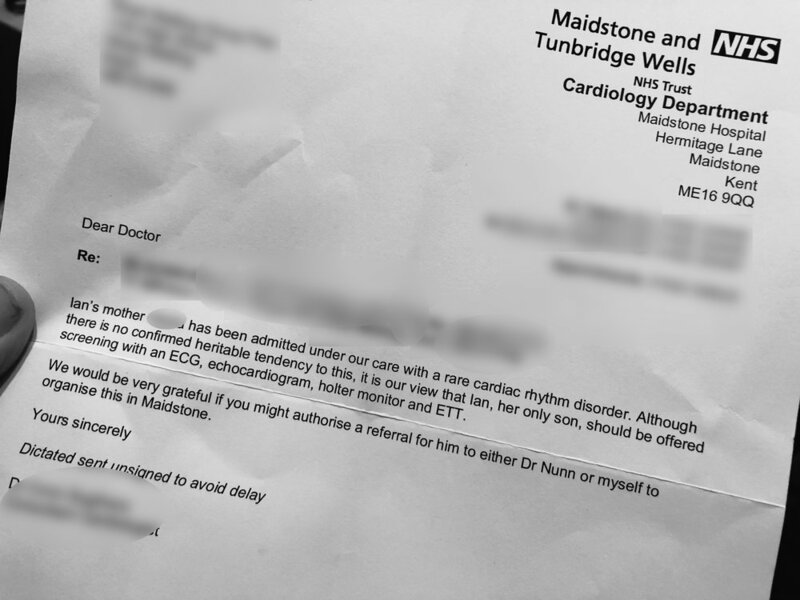 In January my mother suffered a pretty rough time in the hospital and scared us all with heart rhythm problems that the consultant cardiologist eventually described as very rare, and possibly hereditary. I'm due for tests soon, including an EKG to see if I demonstrate any of the same issues. When I saw this band mentioned on Twitter, I thought I'd try heading off the issue in part by getting one and doing my own test first. I also wanted to have one to show the consultant and get his opinion. I just bought an FDA-approved real-time heart rate monitor and EKG that integrates with my Apple Watch as a nondescript band for less than a pair of orthodics, even though I get a medically-necessary orthodics discount. In addition this is broadly a blog about Apple Watch and fitness and health and from that perspective, this new technology is interesting as an indication on the capability of Apple Watch that could manifest into all sorts of sensors that could be useful for training in the future. So here we are. What Does the Kardia Band Do? The Kardia Band is the first Band for Apple Watch that does more than just attach your watch to your wrist. It provides a clinical grade wearable EKG that offers access to a 30-second (or longer if you prefer) EKG whenever you want to take one. And it has a feature called SmartRhythm which intelligently monitors your heart rate and physical activity. When it sees something it doesn't expect, SmartRhythm notifies you to take an EKG. And an EKG is an important test for many. For those who don't know an EKG (also called Electrocardiography or ECG) measures the pattern of your heart rate and is important for those suffering from Afib (or Artial Fibrillation) and should be an indicator for me of irregular heart rhythms. Put simply: it's incredible to have this technology and analysis on your wrist, that you can use at any time of the day. But Doesn’t Apple Watch Already Track for Heart Problems? Since watchOS4 Apple Watch introduced a new feature called "Elevated Heart Rate" monitoring. This is setup in the Apple Watch app on iPhone under Heart Rate. Essentially you set an elevated rate of say 120bpm and if Apple Watch detects that your heart rate is above that, but you haven't been active (which it can tell from the accelerometer) then you will recieve a warning. So that is very useful and has already proven it's value in multiple stories of lives been saved. But Elevated Heart Rate is measuring something different from the Kardia Band which is looking at the rhythm of your heart and not an elevated rate. Interestingly, Apple is currently performing research to identify irregular heart rhythms as a joint study With Stanford Medicine. There is a dedicated app for this, but to be accepted into the programme you must be a US resident so I haven't been able to try it. However, it is clearly something Apple is interested in for the future of Apple Watch. It’s simple. It is a special watch band, that fits like any other but has additional electronics in it to perform the EKG. Initially, I thought the Kardia Band was using the hidden little diagnostic port that is on Apple Watch to communicate with the Kardi app, but with further examination, it's clear this is not the case. I removed the band from the watch completely and was still able to record an EKG so it must be communicating via Bluetooth (though it does not appear in the Bluetooth Health Health Devices listing in settings on the watch). It's a comfortable plastic band (with two lengths in the box just like official Apple bands) that has a metal insert on the bottom strap for the EKG reading. If you switch to a different length band then you can move the metal sensor across, though it is not recommended you do this a lot. When I looked closely at the back of each part of the band I saw a pin at the top that can release it from the normal watch fitting - this I assume is a mechanism that allows the manufacturers to use the same strap for both 42mm and 38mm Watches and looks like it could be uncomfortable but I have not noticed any discomfort in use at all. Once you download the Kardia app to your iPhone and install on Apple Watch you can turn on the SmartRhythm feature. It's important to realise that you can use this without the band - it's just a software feature that monitors your heart rate rhythm and if it detects a potential issue prompts you to take an EKG which you would need the band for, though you could of course use an alternative tool at that point such as the Kardia Mobile device. This is a nasty hack for the Kardia SmartRhythm feature, because you are not actually doing a workout, but your watch thinks you are. So by turning this feature on you will start to fill your Activity rings without leaving your chair. From wearing it for a few hours this morning I logged a massive 1200 calories and over 200 minutes of exercise but I hadn't actually moved from the computer. That's not good. And I think it is avoidable because the Cardiogram app which can also do continuous monitoring does not affect your workout rings at all even though it switches to workout mode. Strike this down to poor software from AliveCor. If you want to use SmartRhythm monitoring then, you need to be not bothered about Workout Rings because those stats will be all messed up. If however the monitoring is more important to you, and it could easily be then the messed up rings is a small price to pay. But still, it would be good for AliveCor to fix this, because it does seem possible, based on my experience with the Cardiogram app. On a personal note and in my daily use of the strap for the last 5 days, I have turned on the SmartRhythm monitoring every now and then and nothing has been detected as unusual which is positive news for me. It will be interesting to compare to the hospital tests I will be having soon. Of course, the main party piece of the Kardia band is its ability to perform a medical grade EKG. This is separate from SmartRhythm Monitoring and requires the band to be on your wrist. It is simple to do: Simply tap the “Record EKG” button in the Kardia app then relax, rest your arms on a stable surface, and hold your thumb against the sensor for 30 seconds. You'll see your heart rhythm drawn in the watch face and at the end, it will perform an analysis and provide a result. Here's an initial video - watch out, its gripping stuff! This is one of quite a few unclassified readings I get which is disappointing. I'd estimate that roughly half of the results I have had have been "unclassified". The documentation states that this can be an issue with your heart rate out of the optimal range of 50-100, and my resting heart rate is usually somewhere around 48-51 so that could account for some of the problems, though I had similar results when my HR was more in the 60-70 range. In fact I've just spent 30 minutes doing reading after reading to try and get anything other than unclassified, and I got 1 out of about 10 attempts as "normal". I even drank strong coffee and stood up to raise my HR a bit (though maybe that made it worse for accuracy? ), and in a brave attemp to push it even higher managed to spill said coffee over my laptop while attempting to film a recording of the app. Oh dear - and still got "unclassified" (though the laptop did survive and now has a more pleasing smell). I couldn't actually find the option to disable "Unclassified Message" in settings, there was one for "unreadable" but that is something different. As it notes, you can send off the result to AliveCor for a clinical review (which cost £5/$5) and when I did that the analysis came back as normal which was comforting. In the US I believe the first clinical review is required and free, but that is not the case for the UK. All the readings you make are synchronsied to the iPhone app which shows a history of both the SmartRhythm readings (if you have it on) and the EKG readings. In each reading you can tag it using standard symtoms, activities, diet or create your oen, and you can export the data to various formats or send the EKG off for clinical review. In addition you can go to settings and configure things like the duration of the EKG recording and if you want to include an audio recording so you can describe how you are feeling when taking the EKG which could be useful to a doctor or medical progessional. Other features within the app such as medication reminders and weight tracking are relatively poorly thought out and not that useful, and the Guest EKG feature, allowing someone else to take their EKG on your account didn't appear to be available in the version of app I was using (though this may because I was using the 30 day trial version). In general I feel the software could be improved and hopefully it will over time. The band itself is £199/$199 which I think is reasonable compared to other official Apple bands and the technology you are getting. Looking at other EKG machines out there, it does appear you can get cheaper monitors such as these on ebay but clearly these are not wrist worn or anywhere near as convenient, or support active all day monitoring. To use the band with all it's features and to keep a history of your EKG recordings or share summary reports with your doctor you will also need a premium account after the inital 30 days which is £9.99/$9.99 a month or £99.00/$99.99 a year. I don't think anyone would want to commit to that unless they had a specific need because of a diagnosed condition and have recieved advice from their doctor or medical professional that it would be useful, potentially in a lfe saving way useful that is. At this stage I don't know which camp I fit into but from the readings that have succeeded so far I am more comfortable with the idea that I don't have a problem. Having said that I will wait until the hospital tests and the clinical review from my consultant cardiologist to determine if I will keep the band or not, in which case a subscription sort of seems essential. This is an exciting piece of technology which arrived at an interesting time for me personally, but also gives us a glimse into the future of what Apple Watch could provide in terms of health monitoring and additional sensors. There is a lot going on in this field and for triathletes training every day there are some interesting developments such as HRV tracking that are a standard part of Apple Watch (and which I am testing currently) that could help you determine your training effectiveness for the day. I expect to see more of these innovations as bands or additional sensors for Apple Watch together with built in capability in future versions of Apple Watch. 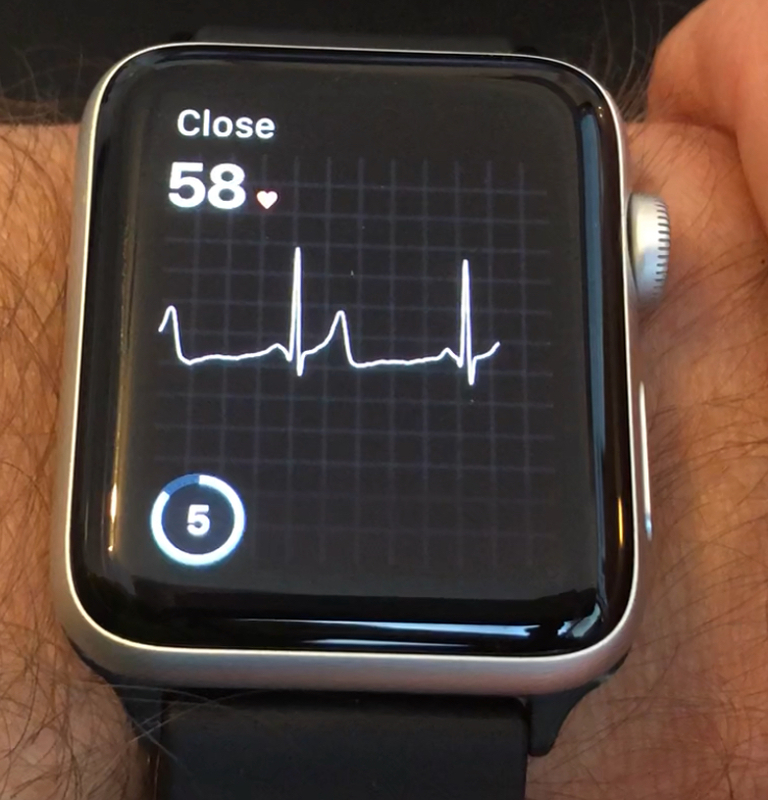 I wouldn't be surprised to see EKG support in a future release of Apple Watch as standard. As far as this implementation goes, the hardware is impressive, fitting a medical grade EKG sensor into a band that is comfortable to wear all day and allows you to take a reading at anytime. I have reservations about the software, mostly the amount of "unclassified" readings I recieved - this should be better, and also around the low value extras included in the iPhone app, and the poor implementation of the SmartRhythm feature that effectively cannot be used with Activity tracking. But all that can be improved with updates I expect. Ultimately though, you can't fail to be impressed with what the Kardia is band capable of, and excited to see what Apple Watch could enable with additional sensors and services such as this. UPDATE: Over the last week I have been continuing logging EKG readings, and they are now much more consistent in returning a “normal” reading, and I have not had any recent “unclassified” ones. Not sure if this is down to machine learning within the app (which would be cool), or the way my heart has been behaving. There has not been an app update. Ever way it’s an improvement as you can see in the video below.